Shawnee City Hall is located at 16 West 9th Street, Shawnee, OK 74801; phone: 405-878-1601. Photo: Walker House, ca. 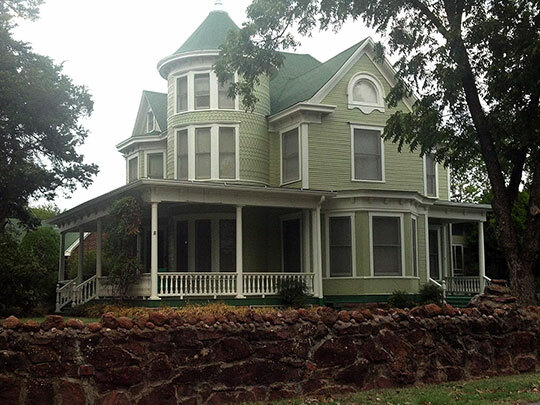 1898, 1801 North Broadway, Shawnee, OK. Listed on the National Register of Historic Places in 1983. Photographed by User:JDessary (own work), 2012, [cc-by-3.0 (creativecommons.org/licenses/by/3.0)], via Wikimedia Commons, accessed August, 2014. After the Civil War, a number of Indian Tribes had been deeded land surrounding Shawnee but in the 1870s, mounting pressure on the federal government eventually opened Indian lands to white settlement in 1889. By 1891, most of what is present-day Shawnee was opened for settlement, but the townsite's future looked dismal until the Choctaw, Oklahoma and Gulf (later Rock island) Railroad came through at the south end of downtown. After the Choctaw Railroad relocated its main repair shops and terminal facilities to Shawnee, it provided the stimulus for the building boom that would make Shawnee a close rival to its western neighbor, Oklahoma City, in these early years of Oklahoma's development. By 1904, the Santa Fe and Katy Railroads had also laid tracks and built stations in Shawnee. Shawnee was located in the heart of cotton, peach, wheat, and potato country and because it could meet the farmers' transportation needs, it quickly became an agricultural center. It had the largest cotton-seed oil mill in the Southwest and one of the largest flour mills in the region. In the first decade of the twentieth century, Shawnee acquired many modern day amenities: a well established and diversified commercial center of two and three story brick buildings along Main Street, paved streets, almost forty different factories, a public park just two blocks north of Main Street, a Carnegie Library, an amusement park (Benson Park), a streetcar system, electrical service, a public waterworks, a country club and two colleges, Oklahoma Baptist and St. Gregory's. By the 1920s, the town's growth had leveled off but the discovery of oil in the nearby Cromwell, Earslboro and St. Louis fields broke the downward spiral of Shawnee economics and the town began to prosper once again. The city was the largest supply base for these oil fields, making Shawnee the location for many new businesses and industries catering to the oil industry. Fortunately, this prosperity came without the negative side effects associated with other communities near the oil fields. Billed as the "Hub of the World's Largest Oil Fields", vacant houses filled rapidly, property values increased dramatically, and by 1927 the demand for space led to a building boom with over $1,000,000 in building permits each month for almost two years. By the 1930s, with the devastation of the cotton crop caused by the boll weevil, declining agricultural prices of the late 1920s, and the nationwide depression, the building boom ended. So did the prosperity of Shawnee. But with World War II and the development of Tinker Field east of Oklahoma City, Shawnee began to prosper once again, this time as a bedroom community in the Oklahoma City Metropolitan Area. Charlotte Patterson, Patterson/Johnson, Architects, Bell Street Historic District, Pottawatomie County, OK, nomination document, 2000, National Park Service, National Register of Historic Places, Washington, D.C.